Another year, another Christmas Clash tournament added to the DuelCircle history books. From everyone at DuelCircle, thank you for supporting us by being a participant or watching the streams. It takes a lot to make game day possible and it’s all for you. Thank you for cheering the participants on as we crowned a new Clash champion this year. I last left off with how we prepare for the game days as a referee. I continue with what it’s like behind the scenes of game day as a referee. We have to be awake earlier than normal on day one since we need to be awake for meetings that happen all morning with the different groups like organizers, elite tournament team, tournament team and referees, streamers, and the shout casters. This gives us time to tell each group important information for game day and make sure everyone is ready and to do any last minute tasks and preparation. After all those meetings, everyone is split off into their groups in the participant server. All the referees were split into groups A and B, with an elite and an organizer handling any questions or concerns in the group. For example if someone was about to be disqualified, we would have to figure out if they broke a rule in order to be disqualified. There were two referee calls going on with groups A and B. In group A we had Crusader Kyle and I in charge of half of the refs while Seth was in charge of group B referees. As we reduced the amount of participants as more rounds passed, we would all joined up in one big call together. While we do pay attention during our matches to make sure no rules are broken, we did have downtime to have some fun between the rounds as the participants prepared for the next one. At some point we had our DuelCircle Janitor Marcus become a DJ for a day between rounds in the group A call and most of us found it amusing. Would hire Marcus again to DJ Luau and Clash in 2019. We did something slightly different this year with having the first few rounds not having a game mode active until semi-finals and the finals. The single elimination rounds on day one without a game mode were played with just the general rules. In the day two best of three rounds we had picked two game modes which would be used again. During semi-finals we reused the game mode Color Me Rad from Luau 2018 with the win condition of the the wizard having to use a spell of at least 2 pips from every school in order to win. 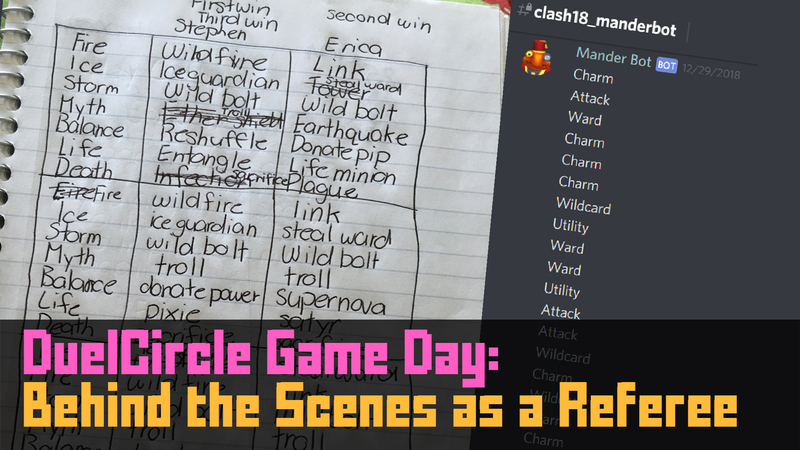 In the finals we brought back Mander Roulette from Clash 17 using brand new technology developed by the manders at DuelCircle. 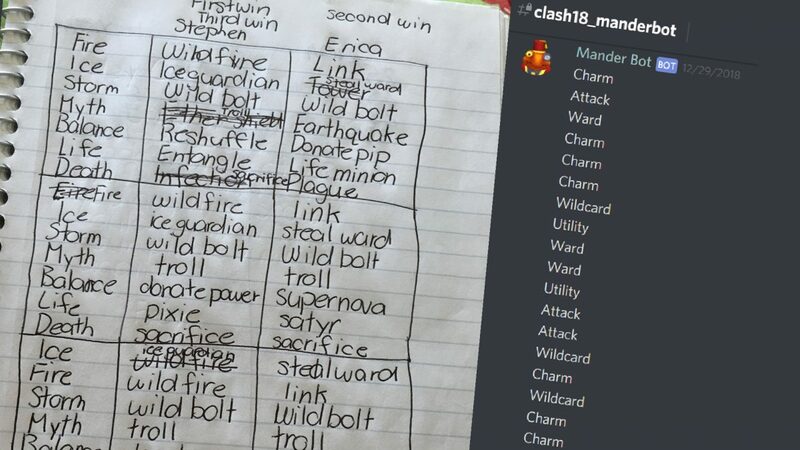 A bot was coded by Ryan that was able to pick what type of spell the participants had to use that round and it was posted in the participant discord and the Twitch chats by ManderBot. Even with only 16 participants this year, there was expected craziness. This year went pretty smooth overall though compared to years before, and I’ve seen things happen in the past years along with the others. As this was my fourth Christmas Clash I’m used to it and expect it to be crazy. This year was different for me as I wasn’t directly refereeing a match like years before and Luau 18. Instead I was in charge of answering questions from the referees and participants in my group while being a shout caster on Ryan’s stream. Things went pretty well and I’m very glad they did. What I learned is that there is always room for improvement as Christmas Clash isn’t perfect. We learn from the years before and improve the next year. I guess I’ll leave it off here with a thank you. Thank you for all the support you guys gave DuelCircle which allows us to host these tournaments for you. I hope next year is just as amazing or even more amazing. Thank you so much.